This video contains much information as Erle covers things that people ask, then answers them in physical form. Fa-Jing, the engine of dim-mak and the internal arts is covered as is dim-mak and the psychology of fighting. The real meaning of "to yield" is explained physically as opposed to the generally accepted idea. Erle explains some excellent way of getting in in order to use the Dim-mak strikes. How to take your art to its internal level is also discussed. Erle teaches that the harder the attack the harder your defense is made automatically when you use internal methods. He explains and shows how to use rebound energy from an attacker's force to put it back onto him. The mind is talked about and shown physically how to ride over one's conditioned instincts so that we make the most out of our own power. The Old Man stance and body posture is explained and shown in gaining power from within. Fa-jing is also taught in a more realistic manner. 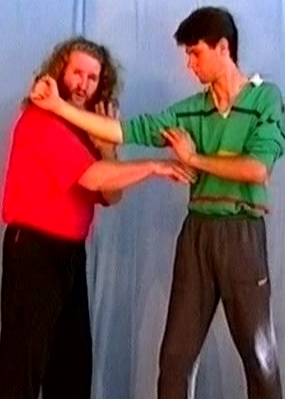 And Erle demonstrates that there are no pulls or pushes in Taijiquan! These are left to the 'Space Cadets' who think that Taijiquan is some sort of 'nice' way of fighting! Releasing the energy when fighting. The Psychology of fighting is covered in a realistic way. When it comes down to it, there IS no psychology in fighting, there is only reflex! Some really necessary fighting methods for the street are shown in this tape.